No. 17 Ohio State (5-3-2, 1-3-0-0 in Big Ten) travels east for a series against nonconference opponent Connecticut (3-7-1, 2-4-1 in Hockey East) after failing to earn a conference victory against then-No. 10 Notre Dame the weekend prior. The Huskies have struggled for most of the season, ranking toward the bottom of the NCAA in penalty-kill success at 72.1 percent and placing 13th-worst in the nation at 3.36 goals allowed per game. 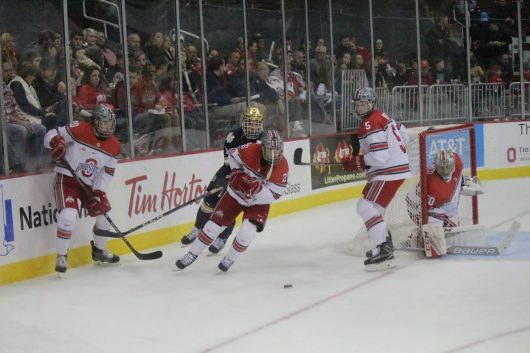 The Buckeyes played UConn at home last season and won the first game 7-4 off a hat trick by then-senior David Gust, but tied the Huskies 3-3 the next night, even after heavily outshooting UConn 49-17 in the game. Regardless of the statistics, head coach Steve Rohlik said this series is no pushover. The Buckeyes are not taking it lightly. Junior forward Maxim Letunov is the main threat for the Huskies. His nine points are tied for the team lead. He finished last year’s campaign with the second-most points at 27, first among returning players. Sophomore forward Alexander Payusov has been the major surprise for UConn this season. His six goals are tied for for 10th place in the NCAA, a season after producing only two assists during the entire year. The Buckeyes come into the series after suffering back-to-back losses, both of which featured comeback efforts that fell just short. The game Saturday went down to the final seconds before the Fighting Irish claimed the victory. Playing from behind has become a staple of the Buckeyes. They have given up the first goal seven of their 10 regular season games this season, and are 3-3-1 when forced to play from behind. Puck drop for the games against UConn are set for 7 p.m. Friday and 3:30 p.m. Saturday at the XL Center in Hartford, Connecticut. Previous: Concert review: The Shins turn back the clock during show at Express Live!